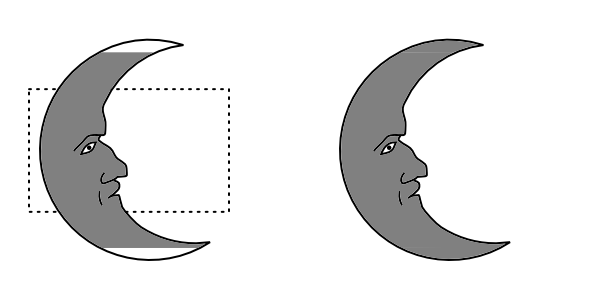 Since the Strumento Riempimento uses pixels to calculate the area to be enclosed, Inkscape will clip the region offscreen to prevent the number of pixels that go into the filling algorithm from becoming too large. If this happens you can either zoom out to do the fill or you can do the fill in pieces. By holding the Shift down while clicking you can add to an existing fill. Unfortunately, this can lead to rendering artifacts between adjacent pieces even though they are part of the same path. Two solutions: 1. Set the Grow/shrink by parameter to 0.10. This will ensure a slight overlap during the filling process. The overlap is removed in the unioning step. 2. Use the Strumento Nodo to adjust the nodes to overlap areas and then use the Tracciato → Unione (Ctrl++) command to remove the overlap. The Strumento Riempimento was applied to the left moon under high zoom. The part visible onscreen is shown by the dotted rectangle. Note the missing fill at the top and bottom. On the right, the missing sections have been added by scrolling in turn so that each missing section was visible onscreen and then with the first filled section selected, Shift-clicking on the missing area.